Every year at CES we see a bunch of science experiment that aren’t very practical. But who are we to decide people wouldn’t want to try out a screen made out of wood. 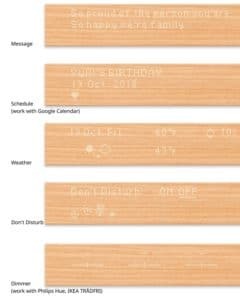 Mui is a smart interactive wood panel that could display time, weather information and etc. to bring some texture into your zen themed home. It is a simple display with limitations, but nevertheless amazing to look at. You can check the weather, read the news, check the calendar, and send/receive messages. In addition, you can control a variety of connected devices such as lighting units, thermostats, and sound systems. With this wooden panel you essentially have full control of your home or office space! Where Mui really shines, however, is the fact that when you are not using it, the panel enters sleep mode and appears as if it is simply an aesthetically pleasing wood design element. To reactivate the smart panel, all you need to do is swipe you finger along its surface. Mui can also be activated with voice and can pair with Amazon Alexa and Google Home. The panel also has a built-in speaker, so it can be used as a smart speaker with the aforementioned digital helpers. Mui was designed to combat the fact that many individuals are bound to their smart phones and tablets. As a result, they miss out on valuable time with friends and family. Mui works to enable a mindful life in which you are truly present by offering and showcasing its functionality only when it is necessary. The smart wood panel is extremely impressive, and it even earned an Innovation Award at CES 2019. Mui is currently available for pre-order on Kickstarter and retails for $999. If you order early you can get it for $499. Our advice is to wait it out. The technology is not yet mature enough to perform consistently yet. More than $2 billion investment and 8 years of time, that’s how much it took Magic Leap to produce its first commercialized product.